Sighting or observation windows for medium temperature reactors etc where food is produced & glass cannot be used. Distributor valves in the poultry industry. Medical equipment & components. Steam cleaning equipment. Components where autoclaving required over long-term. Polysulphones such as PSU 1000 and PPSU 1000 are made from non-UV-stabilised Polysulphone resin. They offer very good radiation stability, low ionic impurity levels & good chemical & hydrolysis resistance. PSU & PPSU often replace polycarbonate whenever higher temperature resistance & improved chemical resistance are required. 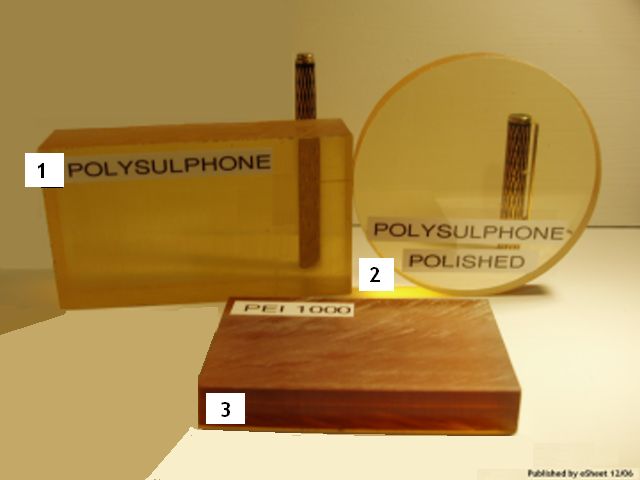 Polyetherimide (PEI 1000) is a much darker material. High mechanical strength, stiffness and creep resistance, also at elevated temperature. Translucent, non-optical quality (except for PPSU 1000 which is black) PSU 1000 can be polished to give >85% CLARITY. PEI is darker. Colour varies from a pale yellow tint when psu 1000 is polished to translucent dark tan for PEI. Sighting or observation windows for high temperature reactors. High heat resistance. electrically insulating, physiologically inert, creep resistance. Can be polished to app 80-85% claritywith Yellow tint. The colours are transparent brown, PEI having the darker colour. Clarity can be improved. See the illustation below.